Dak Lak (VNA) – The Tay Nguyen Central Highlands needs more irrigation facilities to serve the farming of coffee, one of the main exports of the region. 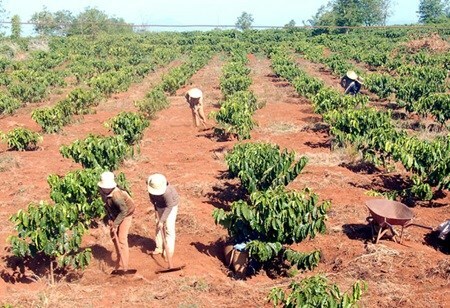 According to Director of the Tay Nguyen Agro-Forestry Science-Technology Institute, water shortage causes heavy losses to coffee farmers in dry season. In 2015, nearly 84,000ha of crops, mostly coffee, were damaged by droughts, causing losses estimated at 1.69 trillion VND. Dak Lak was hardest hit with more than 47,000ha of coffee destroyed. Tay Nguyen provinces have around 573,400ha under coffee plants, but most depend on rivers or underground water for irrigation. Dak Lak has the largest coffee acreage with 204,500ha, but only 46,163ha are watered by irrigation facilities. In Lam Dong province, only 50,335ha of coffee are served by irrigation facilities. However, many irrigation works cannot meet demand, particularly in dry season. Meanwhile, the local underground water resources have been seriously depleted due to overexploitation. Surveys showed the underground water level in Dak Lak has dropped below the average of previous years. In some survey sites, the levels reduced as many as 28m compared to several years ago. The Tay Nguyen Agro-Forestry Science-Technology Institute recommends more investment in irrigation projects to ensure water for farming, while gradually bringing the acreage of coffee farming down to 447,000 ha in accordance with the sector’s master plan devised by the Ministry of Agriculture and Rural Development. At the same time, the institute is transferring to farmers economical watering technologies. Dak Lak province has designed a plan with a 15.3 trillion VND (680 million USD) on building irrigation systems in concentrated coffee farming areas, with the aim of ensuring water for 74,247ha as of 2020. Coffee bean output in the 2015-16 crop in the Central Highlands province of Dak Lak is likely to reach 440,000 tonnes, a decrease of 14,000 tonnes from the last crop, according to the provincial People’s Committee. This is the second consecutive crop that faces a drop in output. Severe droughts have hurt the production as nearly 48,000 hectares of coffee plants suffered from water shortages.A large area of ageing coffee plants is another reason.